I hope your week is going well for you so far. No one likes to have to send sympathy cards, but since sometimes we have to, I thought it would be good to have one or two on hand. I embossed my pink background using a Teresa Collins embossing folder. 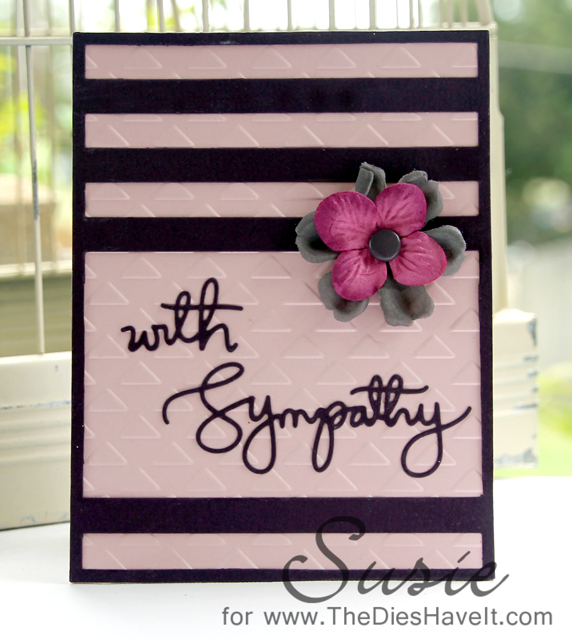 Then I die cut a Stripes Cover Up from MFT Stamps using some deep purple card stock.. I sliced out a few of the stripes to accommodate my die cut sentiment (from Simon Says Stamp) and then added a few soft flowers. I am going to use this WITH SYMPATHY die again soon, so I'll be sure to show that to you too.